I got some truly BEAUTIFUL yarn in the mail yesterday. It's a skein of laceweight 100% wool from Wintechog Hill Farm in North Stonington, Connecticut. I received it as a prize from Sandi (Sandispins on Ravelry), because I was one of the readers in the Jane Austen Book Club readalong/knitalong on Ravelry. The colors are so gorgeously vibrant. The colorway is called "Brilliant", and it lives up to that name. It's a variegated mix of blue and turquoise, and the variegation is nice and subtle. I think it will look killer in lace. There's 266 yards in this skein, so I'll probably go for a scarf. The texture of the yarn is 2-ply, with just a little bit of fuzz. To add to her already generous gift, Sandi also included in my package 2 ounces of "Rock Us roving blend". It's 60% Coopworth Hoggett wool, 40% Shetland Hoggett wool from Wintechog Hill Farm, and a little sparkling angelina. The color is called "Paradice City Green", which is a beautiful pale heathered mix of green, turquoise, yellow and brown, along with just a little sparkle. The Jane Austen Book Club group is great. I read Pride and Prejudice with them. It was my first time reading, and they helped me notice a lot of things in reading the book I never would have noticed alone. If you're looking for a nice read-along/KAL, at a leisurely pace, give them a look. They just started Mansfield Park. I'll be hopping back in when they do Emma in the summer. Oooooh! Those are gorgeous! Need me to bring my ballwinder to club on thurs? Thanks so much for your kind words Joy. 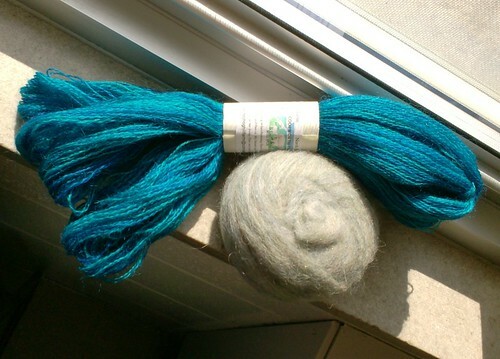 I loved dyeing the yarn from my sheep and dyeing and blending the roving. "Brilliant" is made of my favorite shades of blues and knits up into a wonderful drapey garment. The fuzz is the halo of the yarn and adds a dreamy softness to the garments made with it. I'm so looking forward to seeing what you make with it!